What is affected in CTM? As your calls come in, we have traditionally immediately reported the search query the user typed into the search engine within the source detail column of the call log. That information will likely say “not provided” going forward. 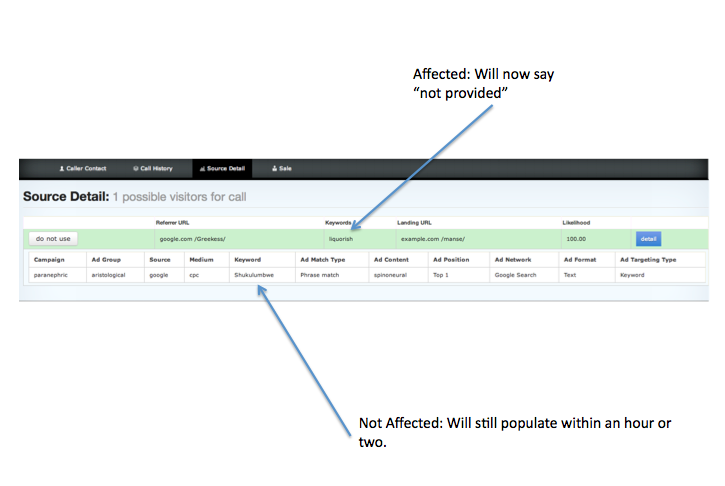 Similarly, the search queries will increasingly show up as “not provided” in the calls by search term report. You will still be able to see the keyword that generated the ad click (as opposed to the actual query as described above) in the call log as well as in the calls by ad keyword report and this information will be available through our API, in our sync to GA etc. Nothing will be changing about that information. This information is just typically not populated for an hour or two after the call comes in due to the time it takes to get it from google. We will post more as we learn more! We now will replace the (not provided) section with the adwords provided keywords. Additionally, it’s useful to note that to get adwords data your Google Analytics account must be linked to Adwords in addition to your CallTrackingMetrics account.